Adolf Hitler’s foreign minister Joachim von Ribbentrop was just about to affix his signa­ture to the Ger­man-Soviet non-ag­gres­sion pact (the Molotov-Ribben­trop Pact), when, on this date in 1939, the Fuehrer sum­moned the com­manders of his various armed forces and other officers to the Berg­hof, his Bava­rian retreat on the Ober­salz­berg. There he told his audi­ence that in the coming war—less than 10 days away—they would see things not to their liking. The war would be “hard and ruth­less,” he pro­phe­sized. “I have sent to the East . . . my ‘Death’s Head Units’ [SS-Toten­kopf­ver­bände, special SS Ein­satz­gruppen death squads] with the order to kill with­out pity or mercy all men, women, and chil­dren of the Polish race and lan­guage.” Two bat­talions of Death’s Head Units were clan­destinely in place in the semi-auto­nomous city-state of Danzig (today Gdańsk) before Septem­ber 1. Hitler wasn’t worried about world reaction: “Who still talks now­a­days of the exter­mi­na­tion of the Arme­nians?” Pre­viously he’d stated that “Sal­va­tion Army methods” didn’t win wars, and on other oc­ca­sions he spoke about the bru­tal­ity that lay ahead of Ger­many as neces­sary “devil’s work.” Hitler had plan­ned for devil’s work all along. But the Ger­man “house-cleaning” of Polish Jews, intel­ligent­sia, busi­ness­men, clergy, and the nobil­ity by SS Ein­satz­gruppen, chiefly using machine guns, sick­ened many Ger­man gene­rals as well as others in the Wehr­macht. As house-cleaning was ex­tended east­wards to the Soviet Union in June 1941, when Hitler vio­lated the German-Soviet non-ag­gres­sion pact by launching Opera­tion Bar­ba­rossa, Reichs­fuehrer-SS Hein­rich Himm­ler put into place a plan designed to buffer the killers from their vic­tims. 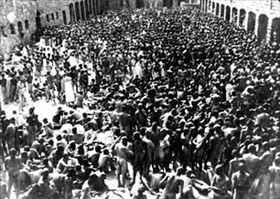 These were the in­fa­mous death camps that would even­tu­ally number over forty. 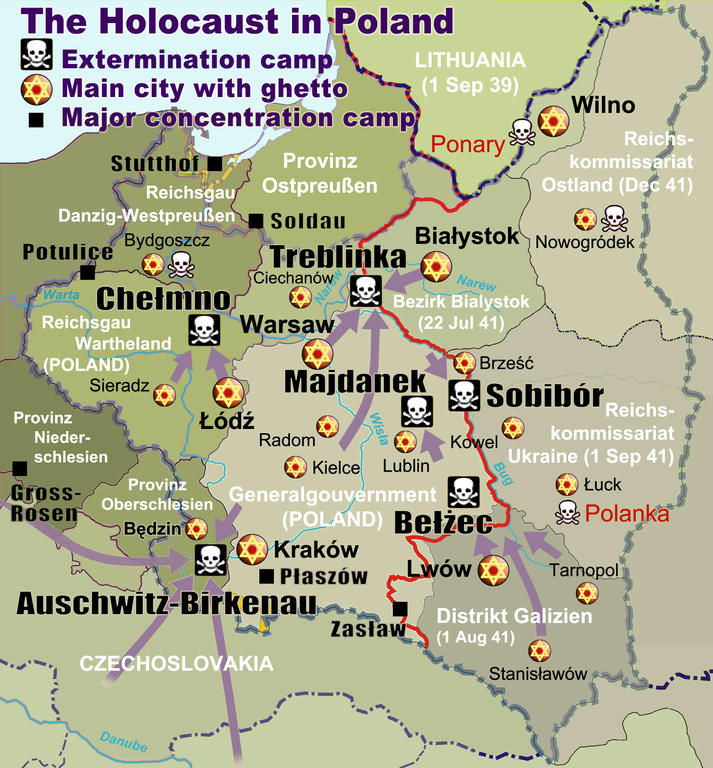 Eight camps were reserved for mass mur­der and six were built in occu­pied Poland, “hidden” from the Ger­man popu­lace (see map). During the reign of Nazi terror in Europe, six mil­lion Jews died—about forty per­cent of the world’s Jewish popu­la­tion—and pro­bably five mil­lion more people deemed “unde­sir­able” by the Nazis: “incor­rigible law offenders,” poli­tical and ideo­logi­cal ene­mies, the physi­cally and men­tally dis­abled, homo­sexuals, Jeho­vah’s Wit­nesses, and Roma (Gypsies), among others in a long list. Above: This map shows all extermination camps (Ver­nichtungs­lager), most major concen­tra­tion camps, labor camps, pri­son camps, ghettos, and major depor­ta­tion routes in Nazi-occu­pied East­ern Europe. The SS-Toten­kopf­ver­bände, ren­dered in Eng­lish as “Death’s Head Units,” staffed the camps. They helped facil­i­tate the Final Solu­tion, or Holo­caust, in col­labo­ra­tion with the Reich Main Security Office (RSHA), an office with­in the Minis­try of the Interior under Reichs­fuehrer-SS Heinrich Himmler. 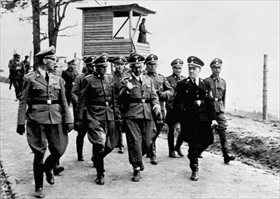 Left: Heinrich Himmler visiting Maut­hausen con­cen­tra­tion camp, April 1941. The site for the camp was near the Aus­trian city of Linz, where Hitler had spent most of his youth, and was per­son­ally chosen by Himm­ler. Maut­hausen was opened on August 8, 1938, a few months after the Anschluss (union) of Aus­tria and Ger­many on March 12, 1938. Even­tually Maut­hau­sen and the near­by Gusen camp together operated more than 101 camps, including 49 major sub­camps (Außen­lager), in Austria and southern Germany. Right: New prisoners await disinfection in Maut­hau­sen’s garage yard, undated photo. Maut­hau­sen-Gusen rented in­mates out to various local busi­nesses as slave laborers, partic­u­larly as more and more Aus­trians were drafted into the Wehr­macht. Alto­gether, 45 Ger­man and Aus­trian com­panies of varying sizes took part in making Maut­hau­sen-Gusen one of the most profit­able con­cen­tra­tion camp com­plexes in the Third Reich. Roughly 85,000 inmates were rented out to gran­ite quarries, muni­tions fac­tories, mines, arms and vehicle fac­tories, and an under­ground Messer­schmitt Me 262 fighter plane assembly plant, among others. 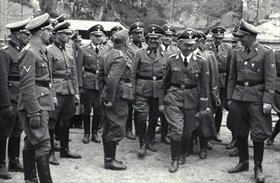 Left: Himmler (right of center) visited Mauthausen-Gusen in 1942 and is shown in this photo visiting the gran­ite quarry. The gran­ite mined in the quarry had pre­viously been used to pave the streets of Vienna, but the Nazi autho­ri­ties en­visioned a com­plete recon­struc­tion of major Ger­man towns in accor­dance with plans of Albert Speer and other archi­tects of Nazi archi­tec­ture, for which large quantities of granite were needed. Right: Arbitrary terror, routine violence, and grueling phy­sical exer­cise were some of the methods of wearing down camp in­mates. 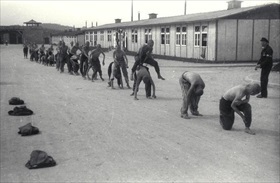 Here a group of young pri­soners is forced to play leap­frog in Mauthausen’s roll-call yard. Left: “Death’s Head Units” provided guards for con­cen­tra­tion and death camps. They were known for their bru­tal and inhu­mane tactics, a result of their doc­trine of “no pity.” Even when camps were not dedi­cated death camps, they took a heavy toll on in­mate lives (exter­mi­nation through labor). The Nazi camp sys­tem expanded greatly after the inva­sion of the Soviet Union in 1941, when large num­bers of Soviet sol­diers were cap­tured. This undated photo shows skele­tonized Soviet POWs (most pro­bably Soviet offi­cers) standing before a bar­racks in Maut­hausen. Most Soviet POWs were kept in huts sepa­rated from the rest of the camp and were a major part of the first groups to be exter­mi­nated in the newly built Maut­hausen gas chamber in early 1942. 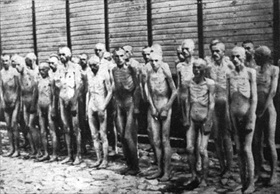 Right: Emaciated survivors of the Mauthausen-Gusen con­cen­tra­tion camp shortly after their liber­a­tion, June 1945. The esti­mated total death toll in the four main camps of Maut­hausen-Gusen ranges from 55,000 to 60,000. In­mate deaths in the sub­camps may have reached 240,000.